3. Mutation induction in Musa - review - Roux, N.S. Induced mutation techniques are particularly important for bananas and plantains (Musa spp.) where there is limited sexual reproduction that could generate genetic variation, the basis for selection. Although spontaneous mutations have contributed to the genetic diversity of Musa and significantly increased its variation, their frequency is very low. The use of in vitro cultures for induction of mutations in Musa spp. could be the method of choice if several steps of the mutation induction process could be optimised. The following aspects were investigated: (a) the plant material used; (b) the determination of an optimal mutagenic dose for physical or chemical mutagens; (c) the dissociation of chimerism; and (d) the application of an early mass screening method for the selection of useful mutants with improved characters. The proposed new methodology, which will speed up the mutation-induction process and improve its efficiency, may revolutionize the use of mutations in Musa spp., especially at a time when there is an increased interest in collecting mutants to understand gene structure and function. Genetic variation is the starting point of any breeding programme. Genetic variation may already be present in nature, may be obtained after several years of selection, or may be produced through hybridisation (for seed propagated crops). For vegetatively propagated crops such as edible Musa spp. it is difficult to obtain genetic variation, because of sterility and polyploidy. Spontaneous somatic mutations have played an essential role in the speciation and domestication of plantains and bananas. Some authors even claim that all the bananas and plantains that we grow and eat were selected in prehistory from spontaneous mutations . Some of these spontaneous mutants in Musa (members of the Cavendish subgroup and plantains) now play a very important role in banana and plantain production. Unfortunately, the rate of occurrence of spontaneous mutations is too low to satisfy practical breeding needs. Mutagenic agents such as radiation and certain chemicals can be used to induce mutations at a higher frequency and generate genetic variation from which desired mutants may be selected. Stover and Buddenhagen , Van Harten  and De Langhe  proposed mutation techniques as a tool for plantain and banana improvement. Early studies on mutation induction in plantains and bananas were performed on seeds and suckers. Stotzky et al. reported on the effects of gamma rays on seed germination and seedling survival in the diploid Musa balbisiana. Reduction of sprouting by irradiation was observed with 'Gros Michel' suckers and there was no survival with doses higher than 50 Gy. One mutant with leaf aberrations and another with more intensive pigmentation were selected in the M1V2 generation [6,7]. Several researchers suggested the use of mutagenic agents for induction of resistance to several diseases [8,9]. They also suggested using adventitious buds for regenerating banana. Menendez applied ethyl methanesulphonate (EMS) to seeds of diploid Musa acuminata in Jamaica . Seeds were soaked for 48 h in 0.04-0.20 M EMS at a temperature of 20ºC. A concentration of 0.10-0.14 M reduced germination by 50%. Irradiation of suckers only gave a low yield of mutagenized material for further screening. Banana suckers have been irradiated with gamma rays prior to excision of shoot tips and in vitro culture. A dose of 10 Gy stimulated explant growth and shoot formation. Leaf expansion on regenerated plantlets was observed up to 25 Gy, but 50 Gy was inhibitory [10-12]. However, De Guzman et al. reported that viable shoots could be obtained from suckers irradiated with a dose up to 100 Gy. Sucker irradiation in situ before tissue culture initiation was not effective and yielded only a low number of regenerants in the M1V1 generation due to the small number of treated suckers. Even when in vivo suckers were irradiated before meristem tip isolation and culture, it was not very effective . The combination of mutation breeding and in vitro culture (also called in vitro mutagenesis) has been found to make the induction and the selection of induced somatic mutations more effective. This method offers several advantages: (a) plant material can be propagated rapidly before treatment to obtain a large population size; (b) further propagation will ensure the formation of periclinal chimeras or homohistont individuals; and (c) increased recovery through decreased somatic competition can be obtained by modifying culture conditions. Plant growth regulators, and in particular a cytokinin-enriched medium, can increase the recovery rate of mutated cells. Hence the combined use of mutation induction and in vitro technology is more efficient, because it speeds up the production of mutants as a result of an increased propagation rate and a greater number of generations per unit time and space . The Musa mutation-induction system, based on in vitro techniques to recover mutant plants and micropropagate desirable mutants, was developed by Novák et al. in the IAEA Laboratories (Figure 1). It is now applied worldwide in several Musa breeding programmes. Gamma irradiation is the main physical mutagen used to induce genetic variation. Novák et al. , Espino et al. and Epp  described the dose response of tissue-cultured shoot tips to gamma irradiation. More recently Roux  standardised the methodology to provide guidelines to mutation induction programmes in Musa spp. The survival rate: measured 40 days after irradiation; a non-surviving explant is an explant which is completely brown and has no shoots. The propagation rate: measured 40 days after irradiation. All shoots per surviving explant were counted. The shoot height: measured 40 days after irradiation. Only the highest shoot of the surviving cluster is counted, from the base of the explant up to the intersection of the youngest leaf with the next leaf. The height is measured in ranges of approximately 0.5 cm. The fresh weight: measured every 10 days until 40 days after irradiation. Five explants were placed in a sterile Petri dish and weighed under sterile conditions. All parameters were expressed as percentages of the control (Figure 2). Figure 1 The current in vitro Musa mutation-induction process using shoot-tip culture and field selection (modified from ). The different Musa accessions showed different responses according to their ploidy level and genomic constitution (Figures 3 and 4). Diploid AA and BB clones were more sensitive than triploid clones. In general the A genome was more sensitive than the B genome. The cultivar Three Hand Planty (AAB) showed the highest sensitivity among the triploid clones, but this could be due to its severe blackening caused by oxidation, which makes it difficult to measure survival rates. Among the seven clones studied, the clone Cachaco (ABB) expressed the lowest sensitivity to gamma irradiation. The two AAA genomes, Williams and Grande Naine, had a similar response to gamma radiation. The clone Kamaramasenge (AB) behaved more like a triploid clone than a diploid clone. Flow cytometric analysis revealed that this Kamaramasenge clone was indeed a triploid. The optimal dosage for mutation induction depended on the parameter studied. For example the survival rate always indicated higher optimal doses than the multiplication rate. Among all the parameters studied, survival rate and fresh weight are preferred because they result in less experimental error than shoot height and multiplication rate. Nevertheless, explant survival is not always clear and fresh weight measurements are labour-intensive and can cause contamination. 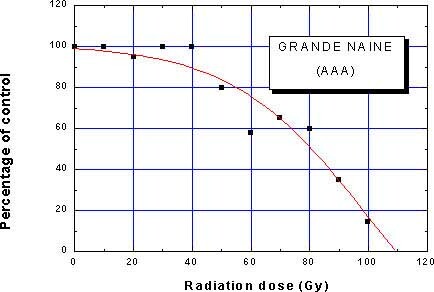 Figure 2 Radiosensitivity test curve illustrating the effect of increasing dose of gamma rays on survival rate of shoot tips from the cultivar Grande Naine (AAA). Data are expressed in percentage of control (non-irradiated shoot tips). Figure 3 Effect of gamma irradiation dosages on in vitro survival rate of seven Musa clones: Calcutta-4 (C4), Kamaramasenge (Kama), Tani (Tani), Grande Naine (G.N. ), Williams (Wil. ), Three Hand Planty (T.H.P.) and Cachaco (Cach.). Figure 4 Effect of gamma irradiation dosages on in vitro fresh weight of seven Musa clones: Calcutta-4 (C4), Kamaramasenge (Kama), Tani (Tani), Grande Naine (G.N. ), Williams (Wil. ), Three Hand Planty (T.H.P.) and Cachaco (Cach.). Figures 3 and 4 may serve as a guide to establish the dose range according to the ploidy and the genomic constitution. The lethal dose at 50% (LD50) can thus no longer be used as a reference. The tendency is now to use relatively low doses because they produce less chromosomal damage and other negative side effects than stronger treatments. However this results in lower mutation frequencies. 10-20 Gy of gamma irradiation for diploid clones Calcutta4 (AA) and Tani (BB). 30-40 Gy of gamma irradiation for the triploids Three Hand Planty (AAB), Grande Naine (AAA), Williams (AAA) and Kamaramasenge which is a triploid. 40-50 Gy of gamma irradiation for the triploid Cachaco (ABB). For NaN3, the highest FE (7.8%) was obtained by the 30 min/2.3 mM treatment, which resulted in 63.3% explant survival and 58.9% shoot regeneration. For DES, a FE of 7.9% was obtained with the 60 min/20 mM treatment, which resulted in 65.5% survival and 38.2% shoot regeneration from explants. For EMS mutagenesis, the recommended treatment is 30 min/200 mM, which resulted in a FE of 5.8%, 80% explant survival, and shoot regeneration from 31.6% of apices. This recommended dose and time of treatment for EMS is quite different from those mentioned above. However, a longer incubation period coupled with low concentrations is preferred because it decreases damage causing hydrolytic by-products and thus improves the mutagenic efficiency . In vitro mutagenesis of multicellular meristems of Musa spp. leads to a high degree of chimerism. Repeated vegetative propagation must be carried out to dissociate chimeras, but the minimum number of cycles required is unknown. In general, mutated cells are difficult to monitor, but mutations, which result in a change in genome number, are an exception. Roux et al. simulated this case by colchicine treatment, followed by flow cytometric analysis. Colchicine treatment induced ploidy chimerism (mixoploidy), and chimera dissociation was assessed using three different propagation systems (shoot-tip culture technique, multi-apexing culture technique and corm slice culture technique). The average percentage of cytochimeras was reduced from 100% to 36% after three subcultures using shoot-tip culture, from 100% to 24% when propagating by the corm slice culture technique, and from 100% to 8% after the same number of subcultures using the multi-apexing technique. None of the propagation systems eliminated chimerism completely. From the FAO/IAEA mutant varieties database, two banana accessions were registered as improved mutant varieties: 'Novaria' and 'Klue Hom Thong KU1'. Using the shoot-tip mutation-induction system (Figure 1), an early flowering putative mutant designated 'GN-60A' was identified among the regenerated plants obtained from gamma ray-treated populations in the glasshouses of the FAO/IAEA Agriculture and Biotechnology Laboratory, Seibersdorf, Austria. The GN-60A clone has been micropropagated and its vegetative progeny sent to Honduras, Australia, South Africa and Malaysia for field testing under commercial plantation conditions. Reports from these four sites showed that not all the plants demonstrated earliness . The chimeric constitution of the original plant could explain this behaviour, as only progenies deriving from the mutated sector are supposed to give rise to the early putative mutant. In Malaysia, early flowering plants obtained in the field were tissue cultured again to produce about 2000 plants for commercial evaluation in the United Plantations Bhd. in September 1993. From this population a selection, flowering about 10 weeks earlier than the original parental clone (i.e. Grande Naine), was launched under the name Novaria in 1995 . In Thailand, at the Department of Horticulture, Kasetsart University in Bangkok, a mutant variety Klue Hom Thong KU1 was released . This variety was obtained by treating tissue cultures with gamma rays at 2.5 krad (25 Gy). The mutant was selected for its bunch size and cylindrical shape from which larger bananas can be selected. Other desirable variants and putative mutants have been identified for release or further confirmation trials. As shown in Table 1, most of the selected traits are agronomically improved characters. Disease resistance seems to be more difficult to obtain through mutation induction techniques. Smith et al. used an original strategy to obtain disease resistance. Instead of irradiating an agronomically superior genotype that is disease susceptible, they irradiated Dwarf Parfitt, an extra dwarf Cavendish banana that has shown a high level of resistance to race 4 of Fusarium wilt. Following radiation, 35 M1V3 out of 500 explants irradiated at 20 Gy were recovered that possessed improved agronomic characteristics (taller plant size, increased yield and no choking). Most importantly these selections appeared to retain the resistance to race 4 shown by the mother plant Dwarf Parfitt. Bhagwat and Duncan [21,29] used gamma irradiation (8-20 Gy) and chemical mutagens to obtain Highgate (AAA) tolerance to Fusarium oxysporum f.sp. cubense. Twelve weeks after inoculation in the greenhouse, 0.3-0.9% of the regenerated plants from irradiated explants and 1.9-6.1% of chemically treated explants had less than 10% vascular invasion in their corms with no external symptoms. These plants were considered tolerant to the fungus and were multiplied, ex vitro, for field screening. Even though the traditional shoot-tip mutation-induction techniques applied to Musa spp. improvement has produced some useful mutants, there are some limitations, i.e. treated shoot tips show a high degree of chimerism. This is a serious obstacle because mutated cells cannot be distinguished from non-mutated cells. Hence techniques that reduce the formation of non-chimeric plants will enhance the production of more stable and useful mutants. The advancement of mutation induction relies greatly on embryogenic cell suspensions . Another obstacle comes from the random nature of mutation induction. Hence as many plants as possible need to be screened, but in bananas field screening is expensive, laborious and site-specific. Consequently selection efficiency would be increased by the development of mass screening methods at the in vitro level followed by further testing of selected plants in the greenhouse and in the field [31,32]. In recent years interest increased substantially to understand the Musa genome. This is caused by new advances in research and the access to enabling technologies to understand gene structure and function. Mutation induction can obviously contribute to functional genomics. BUDDENHAGEN, I.W. "Disease susceptibility and genetics in relation to breeding of bananas and plantains", Banana and Plantain Breeding Strategies, (PERSLEY, G.J., DE LANGHE, E.A., Eds), ACIAR, Canberra 21 (1987) 95-109. STOVER, R.H., BUDDENHAGEN, I.W., Banana breeding: polyploidy, disease resistance and productivity, Fruits 40 (1986) 175-191. VAN HARTEN, A.M., Mutation Breeding: Theory and Practical Applications, Cambridge University Press, Cambridge (1998). DE LANGHE, E., "Towards an international strategy for genetic improvement in the genus Musa", Banana and Plantain Breeding Strategies (PERSLEY, G.J., DE LANGHE, E.A., Eds), ACIAR, Canberra 21 (1987) 19-23. STOTZKY, G. et al., Some effects of gamma irradiation on seeds and rhizomes of Musa, Am. J. Bot. 51 (1964) 724-729. AZZAM, H., LINDEN, D.B., Radiation effects on banana corms, Musa sapientum, J. Agric. Univ. Puerto Rico 4 (1965) 17-21. VELEZ FORTUÑO, J., CEDEÑO MALDONA, A., The use of radiation in breeding banana (Musa sapientum L.), (Proc. Study group meeting, Buenos Aires), IAEA Vienna (1972) 485-488. PANTON, C.A., MENENDEZ, T., Possibilities and implication of mutation breeding in Jamaica, (Proc. Study group meeting, Buenos Aires), IAEA, Vienna (1972) 61-65. MENENDEZ, T., "A note on the effect of ethyl-methanesulphonate on Musa acuminata seeds", Induced Mutations in Vegetatively Propagated Plants, IAEA, Vienna (1973) 85-90. DE GUZMAN, E.V., "Project on production of mutants by irradiation of in vitro cultured tissue of coconut and bananas and their mass propagation by the tissue culture technique", Improvement of Vegetatively Propagated Plants through Induced Mutations. IAEA-TECDOC-173, IAEA, Vienna (1975) 53-76. DE GUZMAN, E.V., et al., Plantlet regeneration from unirradiated and irradiated banana shoot tip tissues cultured in vitro, Philipp. Agric. 63 (1980) 136-140. DE GUZMAN, E.V., et al., "Production of mutants by irradiation of in vitro cultured tissues of coconut and banana and their mass propagation by tissue culture technique", Induced Mutations in Vegetatively Propagated plants II, IAEA, Vienna, (1982) 113-118. DE GUZMAN, E.V., et al., "Banana and coconut in vitro cultures for induced mutation studies", Improvement of Vegetatively Propagated Plants and Tree Crops Through Induced Mutations, IAEA, Vienna, TECDOC-194 (1976) 33-54. MORPURGO, R., et al., Enigma of banana breeding: A challenge for biotechnology. Agro-Food Industry Hi-Tech July/August (1997) 16-21. NOVAK, F.J., et al., Mutation induction by gamma irradiation of in vitro cultured shoot-tips of banana and plantain (Musa cvs). Trop. Agr. (Trinidad) 67 (1) (1990) 21-28. NOVAK, F.J., et al., "Micropropagation and radiation sensitivity in shoot-tip cultures of banana and plantain", Nuclear techniques and in vitro culture for plant improvement, IAEA, Vienna (1986) 167-174. ESPINO, R.R.C., et al., "Mutation breeding on selected Philippine fruit crops", Nuclear Techniques and In Vitro Culture for Plant Improvement, IAEA, Vienna (1986) 429-433. EPP, M.D., "Somaclonal variation in bananas: a case study with Fusarium wilt", Banana and Plantain Breeding Strategies (PERSLEY, G.J., DE LANGHE, E.A., Eds), ACIAR, Canberra 21 (1987) 140-150. ROUX, N., "Improved methods to increase diversity in Musa using mutation and tissue culture techniques", (Report of the second Research Co-ordination Meeting of FAO/IAEA/BADC Co-ordinated Research Project), Kuala Lumpur (1997) 49-56. OMAR, M.S., et al., In vitro action of ethyl-methanesulphonate on banana shoot tips, Sci. Hort. 40 (1989) 283-295. BHAGWAT, B., DUNCAN, E.J., Mutation breeding of banana cv. Highgate (Musa acuminata, AAA Group) for tolerance to Fusarium oxysporum f.sp. cubense using chemical mutagens, Sci. Hort. 73 (1998) 11-22. WALTHER, F., "Effectiveness of mutagenic treatments with ionizing radiations in barley. In: Induced Mutations in Plants", Proceedings of a FAO/IAEA Symposium on the Nature, Induction and Utilization of Mutations in Plants, Pullman, WA (1969) 261-270. SAVIN, V.N., et al., Enhancement of chemically induced mutation frequency in barley through alteration in the duration of presoaking of seeds, Mut. Res. 6 (1968), 101-107. ROUX, N.S., et al., Effectiveness of three micropropagation techniques to dissociate cytochimeras in Musa sp., Plant Cell, Tissue Organ Culture 66 (2001) 189-197. ROUX, N., et al., "Complementary approaches to cross-breeding and mutation breeding for Musa Improvement", Proceedings of the first Global Conference of the International Musa testing program, FHIA, Honduras, (1994) 213-218. MAK, C., et al., "NOVARIA - A new banana mutant induced by gamma irradiation", Report of the first FAO/IAEA Research coordination meeting on "Cellular biology and biotechnology including mutation techniques for creation of new useful banana genotypes", Vienna (1995) 81-94. ANONYMOUS, List of new mutant cultivars; Musa sp. (banana). Mutation Breeding Newsletter 35 (1990) 32-41. SMITH, M.K., et al., "In vitro mutation breeding for the development of bananas with resistance to race 4, fusarium wilt (Fusarium oxysporum f.sp. cubense)", Final reports of FAO/IAEA Co-ordinated research programme, IAEA, Vienna, TECDOC-800 (1995) 37-44. BHAGWAT, B., DUNCAN, E.J., Mutation breeding of Highgate (Musa acuminata, AAA) for tolerance to Fusarium oxysporum f.sp. cubense using gamma irradiation, Euphytica 101 (1998) 143-150. ROUX, N., et al., Usefulness of embryogenic cell suspension cultures for the induction and selection of mutations in Musa spp., This book, Chapter 4. ELSEN, A., DE WAELE, D., Recent developments in early in vitro screening for resistance against migratory endoparasitic nematodes in Musa, This book, Chapter 16. MAK, C., et al., Early screening techniques for Fusarium wilt resistance in banana micropropagated plants, This book, Chapter 18.